When you make a reservation with a restaurant but doesn’t show up for it, you’re a no-show. We learned that last week. Now, you reserve a table for yourself and your boyfriend. You arrive at the restaurant five minutes ahead of time, but your boyfriend never shows. He is a no-show, and you get stood up. 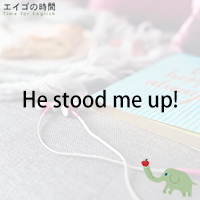 To stand someone up means to fail to show up for a meeting or a date. For example, your boyfriend stood you up time and again, so you decided to break up with him. You stood your girlfriend up once, and she never forgave you. She can’t stand being stood up. Sadly, this can happen to just anyone. If you got stood up at a restaurant, what would you do? Would you rather eat alone, or leave with your stomach empty?